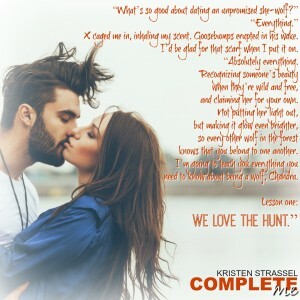 Happy Book Birthday, Complete Me! 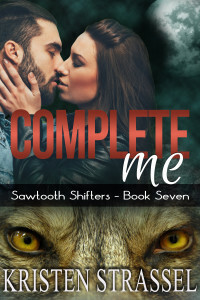 X has found his mate, and the Sawtooth Shifters series is complete. This series became so much more than I expected for me. Every character I write becomes real. I write in first person, as you know, so it’s like they’re telling me their story just like they tell it to you. I’ve never written a seven book series before, and it was only supposed to be four books. Just the Channings and the Forever Home girls. But once I met the Lowes, they refused to be silent. Even though the characters are far from perfect, the characters found the people who loved them just the way they were. It was never about having to ‘fix’ each other, but each character realizing they were good enough just as they are. That there was so much more right than wrong. In Sawtooth Forest, I created a place I’d like to call home. It’s been hard to let these characters go. I cried when I typed the end. A rogue attack kept him trapped in his wolf form, and he’s had enough of the endless war on Sawtooth Forest. His brothers want to play by the rules, but not X. If they don’t take care of this threat, there will be no future to fight for. Her parents left Sawtooth Forest before she was born. They didn’t want her to be sold, instead they gave her a chance to find her true mate. Now she’s in the place she wants to call home, but she never expected her pack to reject her. Except for one. X knows that Chandra isn’t just any wolf, she’s his mate. And he’ll show her why Sawtooth Forest is worth fighting for. X came over to me. Determination and something that made my insides throb uncontrollably swirled in those incredible eyes. He pulled me into his body roughly and his lips crashed against mine in a kiss. I was too stunned to move. This gorgeous, naked man kissed me in a room full the people who, whether they wanted me or not, had become my whole world in such a short amount of time. I imagined this is what it felt like to be stuck in a snow globe, frozen in time with everything raining down around me. Like the decorative orb, it was magical. X didn’t give up. His lips moved against mine, coaxing them open. Just like those candy-colored eyes, he tasted salty, sweet, and a little bit forbidden. He’d been starving for this for much longer than the month I’d cared for him, and so had I. I hadn’t exactly been holding out for my true mate, but the way X touched me, his hand cupping the back of my head protectively, his thumb massaging my nape in time with the kiss, I felt like I’d never done this before. Thank God he held on to me. X probably thought I’d run, but this kiss had turned my knees to junk. “Come upstairs with me,” he whispered against my cheek.